The case in which dismissed southern province Patriotic Front (PF) Political Secretary Brian Hapunda is charged with fraud failed to take-off in the Livingstone magistrates court on Monday. The case has been adjourned to 29 November, 2013 for commencement of trial because the prosecutor handling the case has been transferred. Brian Hapunda, 30, of house number 903 Lubwe crescent in New Avondale Lusaka and also a resident of Nottie Broad in the tourist capital, appeared before Livingstone Magistrate Edsen Shanduba for commencement of trial. Hapunda is charged with five counts of offences contrary to section 336 (a) of the penal code chapter 87 of the laws of Zambia. Particulars of the offence are that in count one Hapunda on 26 February this year, with intent to deceive or defraud did obtain a sum of K24, 000 from Inyatsi construction by falsely pretending that he was sent by the Patriotic Front Party to solicit for financial donations for campaigns for the Livingstone constituency by-election. In count two Hapunda is said to have made documents without authority from the ruling party PF, soliciting for K2, 000 from Southern Water and Sewerage Company (SWASCO). In count three, Hapunda on 21st May and 24th May 2013, knowingly and fraudulently did utter a false letter to a Mr. Charles Shindaile the Managing Director for SWASCO. And in the fourth count, Hapunda is said to have obtained money amounting to K2,000 kwacha from SWASCO pretending that he was sent by the PF to solicit for financial assistance for political party operations when in fact not. In count five, Hapunda between 1 January and July 2013 with intent to deceive or defraud did obtain K11,000 kwacha cash from Bhukans Brothers pretending it was meant for political operations in the province when in fact not. 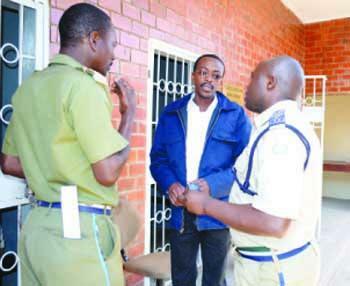 Hapunda pleaded not guilty to all five counts levelled against him when he appeared in court last August. The court has since extended Hapunda’s bail to 29 November, 2013.